The moment we stepped into the magical, whimsical office of Amy Richard's Illustration we knew we were in for a treat. When I was working for a local Mexican restaurant I actually stumbled upon her "Taco" illustration and reached out to feature it on their Instagram page. From there I saw her at a few Sola pop-up markets and immediately fell in love with her designs. 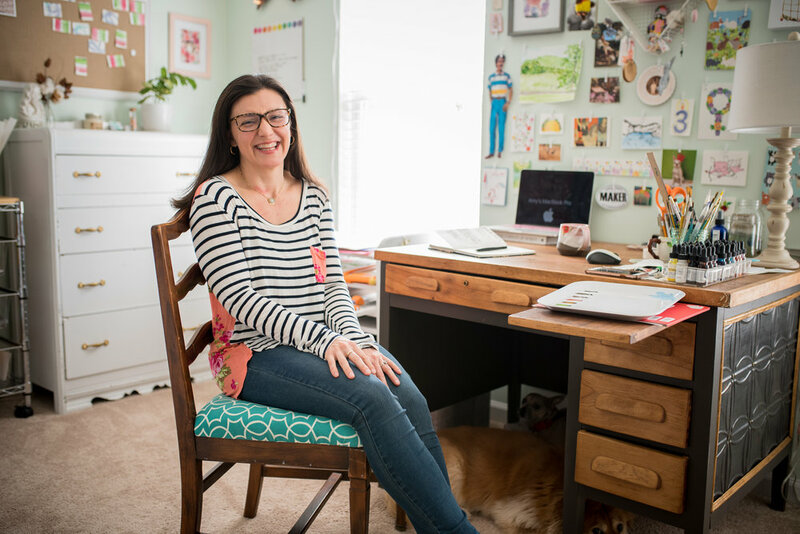 We are so honored to have her as our February creative and if you go to her page and sign up for her newsletter you'll gain access to her monthly desktop calendar backgrounds. How did you know you wanted to start this business? How did your craft come about? Towards the end of college, while working on my art education degree, I got really into children's book illustration. I knew then that while I planned to teach, ultimately I was an artist first and would find a way to work towards that as my main gig. For me it is taking breaks. Even the stuff I don't really like doing (i.e. finances, tax stuff) I don't really mind doing, if that makes sense. I think its because its all mine, its my thing that I have worked to build and even if its just entering my monthly info into my finance spreadsheets, I'm still pretty content to do it. I have a hard time putting the work down—it's pretty much always on my mind, especially ideas for what I will create next. I started using watercolor about 5 years ago now. I loved the look of it, it wasn't quite as popular as it is now and I didn't really know any other artists in the area that were using it. As soon as I started I was hooked. I love the way that it can be used to create super broad strokes that look light and effortless or the way I can apply it in a more detailed way, as with my pet portraits. My favorite subjects are flora, fauna, & food! My studio space is as whimsical as my art. It is somewhat the aesthetic of the bedroom I always wanted as a kid. The walls are the softest shade of sea foam green and I get incredible lighting from two windows that sandwich my desk. I have lights, colorful garlands, art, greeting cards, photos, notecards, patches, and all kinds of treasures adorning the walls that keep me inspired. One of my favorite things is an old photo of my mom, me at 2 and my godmother who has passed, but was one of my and my mom's fav people ever. There is pretty much always a dog or two or three snoozing under my desk—I don't know how they all fit! I love working from home and do my best work for illustrating first thing in the morning. I think the pet portraits are my favorite. I am so attached to my 3 pups and I love creating something for customers that is so personal and can be enjoyed for a long time. Recently I have been commissioned to do more and more memorial portraits which is makes me feel pretty humbled. The fact that folks trust me to create something so special is really pretty neat. One of my main goals for 2018 is to finally finish and self-publish a children's book I started 4 years ago. I have recently come up with some new directions for imagery and being that its a picture book, the illustrations have to be just right. I have completed/ about 50 illustrations so far and am re-working about 70% of them again this year. Some of the illustrations I'll be recreating for the third or fourth time! I am also working hard to find new wholesale partnerships both locally and regionally. As a creative, the work load is about 30% creating and about 70% other stuff (marketing, biz things, emails, newsletters, social media, filling orders, etc.) Be prepared to put in the time to learn and make mistakes. Everyone has their own journey- mind definitely looks less like a straight line and more like a tangled ball of yarn! That is where the good stuff lives, in the journey. Also be kind. This community is small and you never know when a connection may come around again in your life. What are your most effective marketing tools? What are some Things that drive your business? Recently, after about a year of dread, I started a monthly newsletter and I am totally loving it! I thought a lot about the kind of content I was willing to subscribe to and am striving to make my connections with people authentic and informative. We can't control the algorithms of social media but we can control things like our own website domains and newsletters. Folks in the maker community that I admire made their newsletters into types of 'clubs' which seemed really fun to me and that is how I came up with the "Sloth Mail Club." Illustrations for a children's book Amy is working on. The easiest place to find the widest variety of products would be in my Etsy store. You can currently find some of my products at Relish Cafe, Sola Coffee, Artspace, Bulldega & Ollies. Is there anything else you'd love for your audience to know about you? I'm a big believer in the power of a simple greeting card in someone's mail box to brighten their day. I come from a family of card senders and my Mom taught me the importance of snail mail correspondence, especially in an age where people can be too busy to send a text. I really think card sending and writing notes by hand is a lost art. I am also a believer in the necessity to surround yourself in your space with images that move you and keep you inspired. Don't forget to check out Amy Richard's Illustration website, Etsy shop, or follow along on Instagram. If you want to get to know Amy a little better why not sign up for her SkillPop class this month on February 13th and take home a floral watercolor painting!